Everyone loves a good field trip! 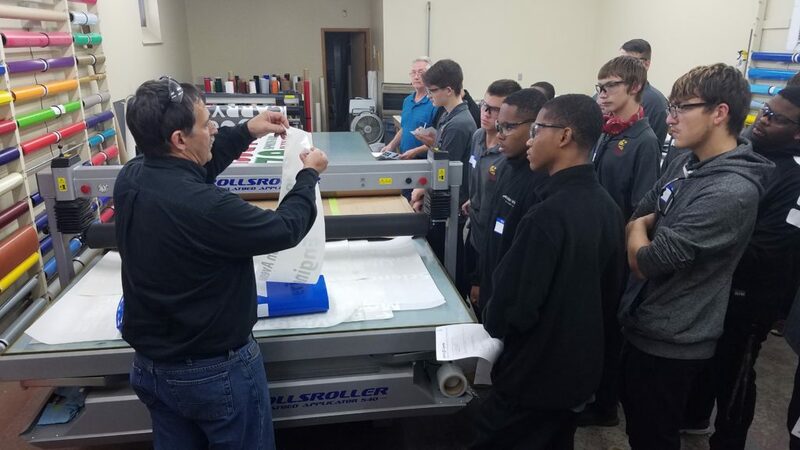 According to the International Sign Association (ISA), “Some 2,630 students of all ages visited sign, graphics, and visual communications companies as part of Sign Manufacturing Day 2016. The event is sponsored annually by the International Sign Association in conjunction with the National Association of Manufacturers. This year, 46 locations opened their doors to students throughout the U.S. and Canada. 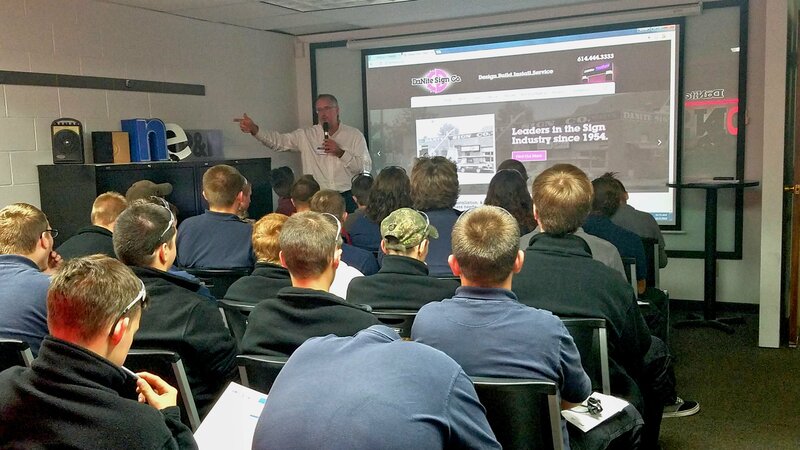 DaNite owner, Tim McCord, gives a presentation in the Cal Lutz Design Lab before the shop tour commences. Engineer & Project Manager, Michael Cox, prepares to lead a group from the Design Room in to the fabrication area. 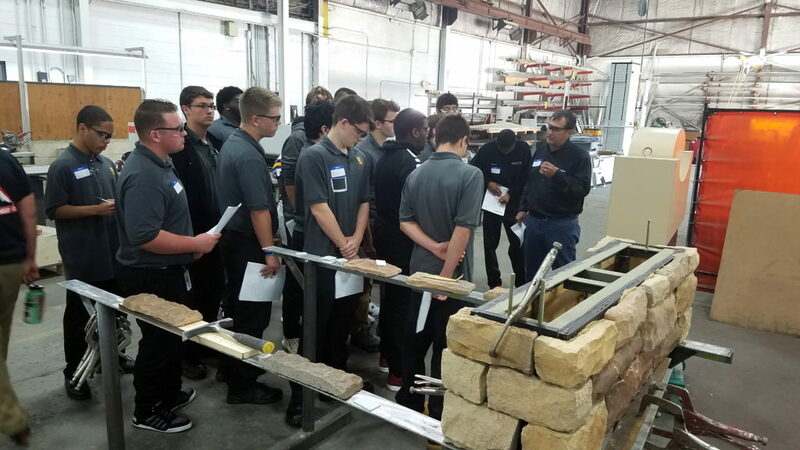 Operations Manager, Bruce Tokar, describes a stone veneer base technique to the students. 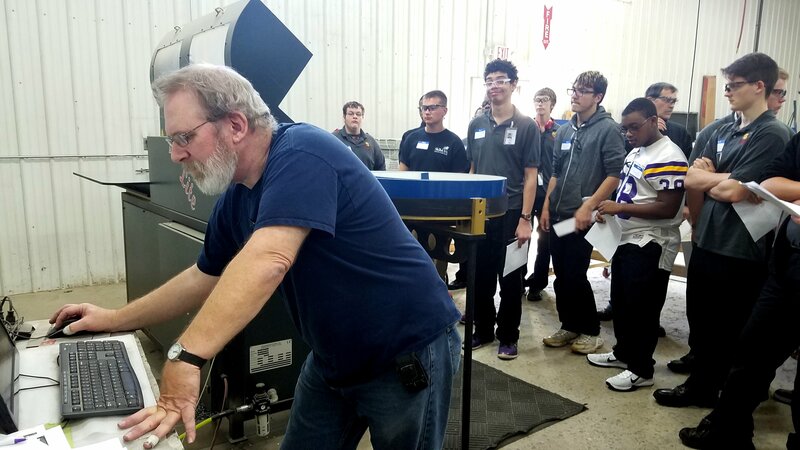 Students from the Eastland Career Center and Southwestern City Schools got to tour DāNite’s 33,000 sq ft facility and see examples of the diverse variety in trades required in the production a single sign. From administrative and sales staff, project managers, estimators, graphic designers, engineers, steel workers, welders, electricians, painters, printers, crane operators, service techs, and helpers, it takes all sorts of skilled tradesmen and women working together towards a common goal of excellence to produce each and every sign. 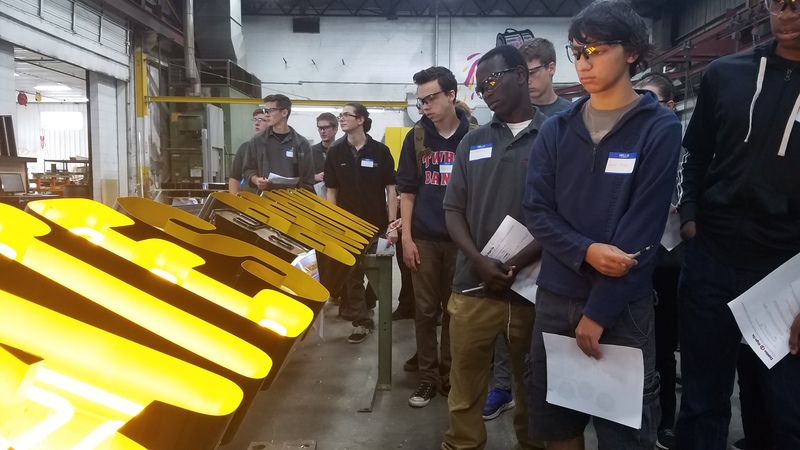 Many students claimed that the filed trip was an eye opening experience and expressed interest in pursuing a career in the sign industry. Lonnie loads a file in to the Accu*bend machine which shapes channel letters. Watching it form letters is always a big hit with the students. Trim cap letters which make up the faces of channel letters are displayed about the assembly area. 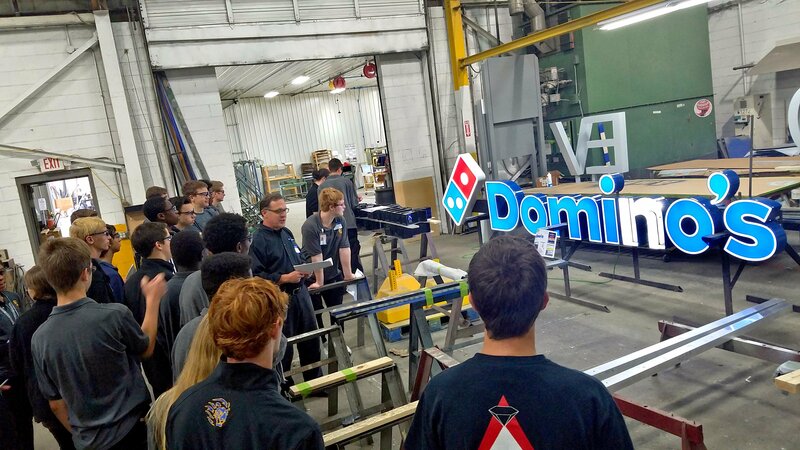 Students view the inside of a Domino’s “n” to see how the LED modules are dispersed. 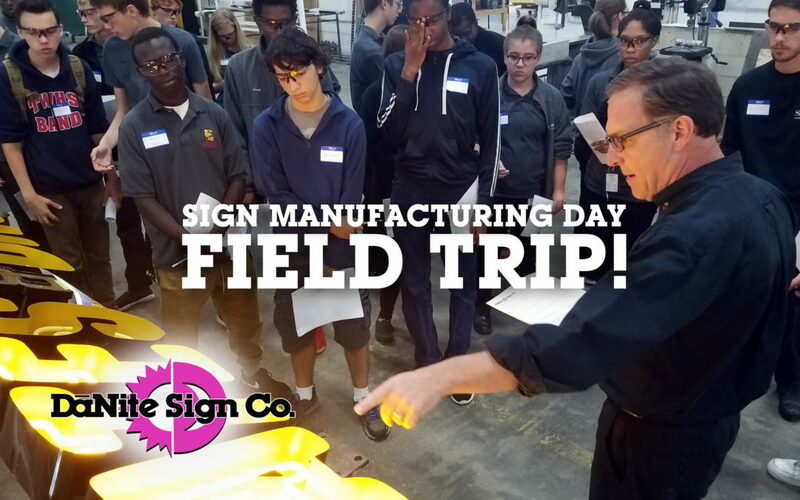 After Sign Manufacturing Day last year, DāNite Sign Co took on one of the most inquisitive and engaged senior students on the tour as a shop intern. 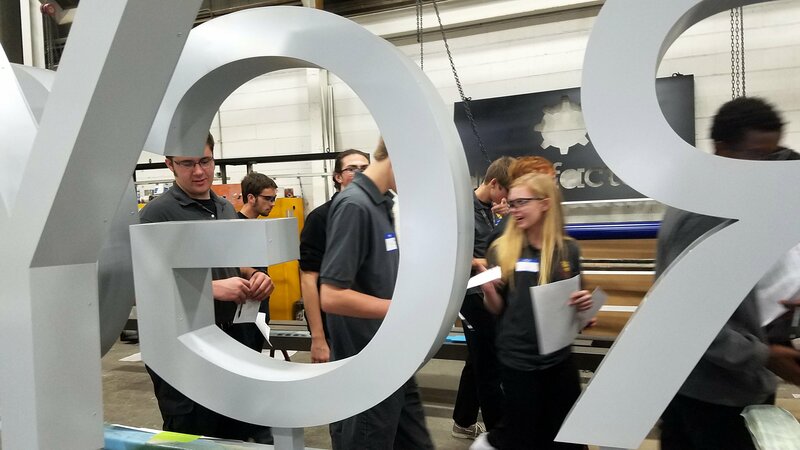 This year, Preston was able to share his hands-on experience in the sign industry with his former classmates, now as a full time DāNite employee! In December of 2016 an eager welding student from Southwest Career Academy will begin an internship with DāNite Sign Company, learning sign fabrication in the shop. He’s extremely excited to begin, stating that working in the signage industry feels like it could be more of a career path than just a job for him. In fact, of the 90 students that toured the DāNite there were 40 that expressed interest in an internship! Recently painted non-illuminated bottom mount dimensional letters. 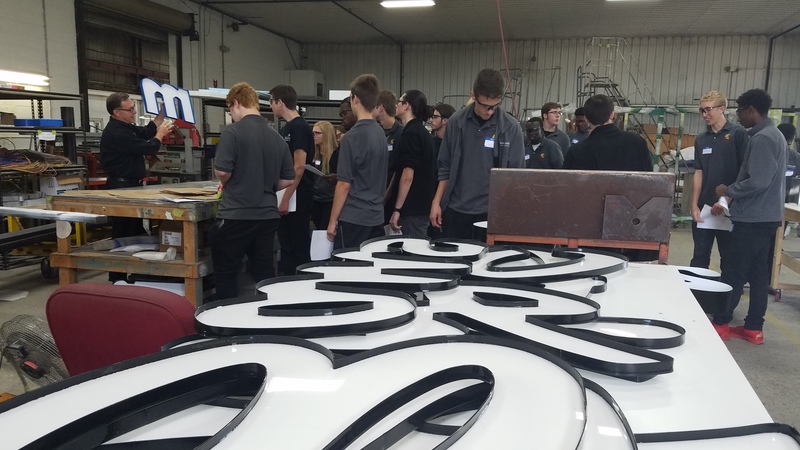 Students learn how flexible LED tubing is used to mimic an exposed neon look in open faced channel letters. In the print and vinyl room, Bruce demonstrates how the sheet layers of cut and weeded vinyl lettering are peeled apart for application. At the end of the tour DāNite fed the hungry students lunch. 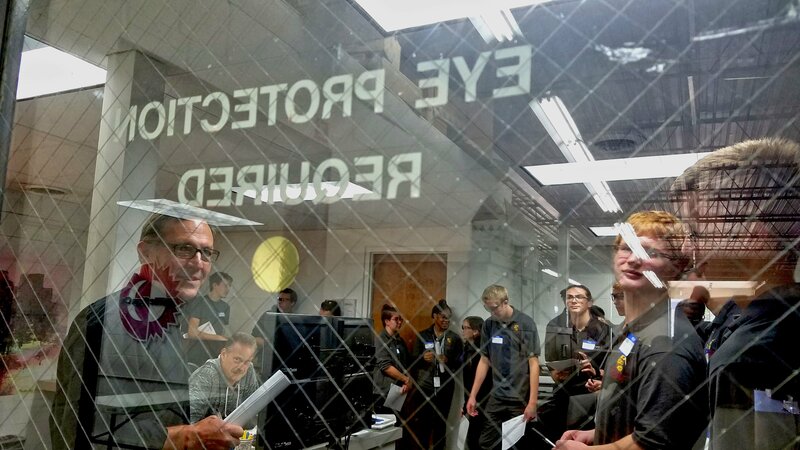 They ate a bakers dozen of the enormous 30″ D & E-Z-O’s Destroyer pizzas, (apparently high school students can really put away some pizza), then posed for group photographs in a grounded crane basket against a printed backdrop from a DāNite installer’s image atop the AEP building. Lunch in the truck bay included dozens of 2 liters of soda and 13 extra large 30″ pizzas. All in all, the day was educational, filling, and good fun for the students and DāNite employees alike. It’s easy to become numb to a working environment that you see day in and day out, but the palpable excitement that comes from taking almost anyone on a tour of the DāNite shop is enough to remind all of us of how special a place this is, and how truly fascinating the sign industry can be. 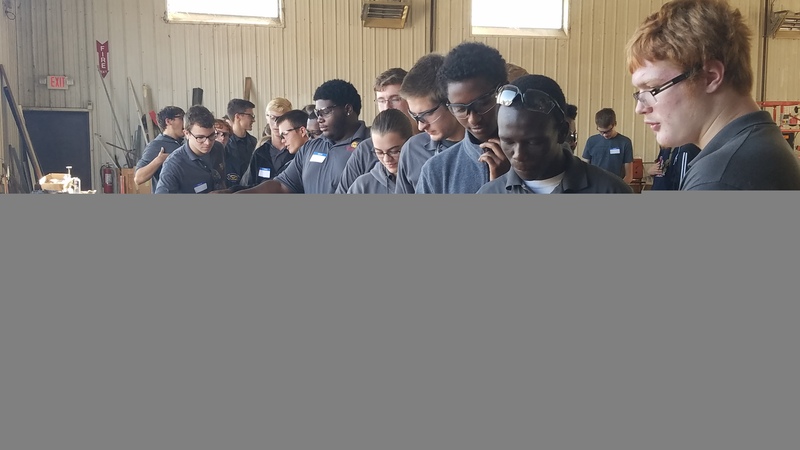 Send a group of special trades students on the tour, and the excitement is amplified tenfold because they’re not just interested observers. 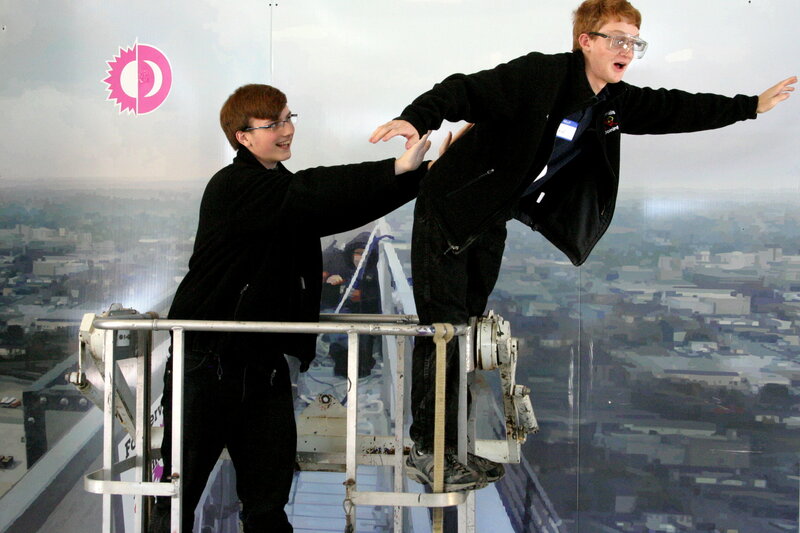 Students goofing around after the tour in a grounded crane basket against a printed backdrop from a DaNite installer’s image atop the AEP building. DāNite Sign Company looks forward to continuing this sharing & mentoring tradition for many, many years to come. We are grateful to our partners at the International Sign Association for giving us the platform from which to host such a worthwhile event.